A hydrogen radio frequency discharge, the first element inside a hydrogen maser. A maser is a device that produces or amplifies a highly intense, coherent beam of electromagnetic waves, particularly in the microwave region. Historically, the term came from the acronym "Microwave Amplification by Stimulated Emission of Radiation." Modern masers, however, emit over a broad portion of the electromagnetic spectrum. Charles H. Townes, who led the team that developed and built the first maser, therefore suggested replacing "microwave" with "molecular" in the acronym. When masers were developed to operate in the optical region, they were initially called optical masers, but it has become more common to refer to them as lasers, where "l" stands for "light." Masers produce extremely sharp radiation with low internal noise, and they serve as high-precision frequency references. The hydrogen maser, in particular, is an "atomic frequency standard" and is useful as one form of atomic clock. Given their high sensitivity, masers are also used as detectors and electronic amplifiers in radio telescopes. The experiments that first detected the cosmic microwave background radiation employed a maser amplifier. This radiation has been attributed to the Big Bang origin of the universe. As noted above, maser was initially suggested as an acronym for "microwave amplification by stimulated emission of radiation," to describe devices that emitted in the microwave region of the electromagnetic spectrum. The principle of stimulated emission has since been extended to more devices and frequencies, and so Charles H. Townes suggested modifying the original acronym to "molecular amplification by stimulated emission of radiation." When the laser was developed, Townes, Arthur Schawlow, and their colleagues at Bell Labs pushed the use of the term optical maser, but this was largely abandoned in favor of laser, coined by their rival Gordon Gould. In modern usage, devices that emit in the X-ray through infrared portions of the spectrum are typically called lasers, and devices that emit in the microwave region and below are commonly called masers. Gould originally proposed distinct names for devices that emit in each portion of the spectrum, including grasers (gamma ray lasers), xasers (x-ray lasers), uvasers (ultraviolet lasers), lasers (visible lasers), irasers (infrared lasers), masers (microwave masers), and rasers (radio frequency masers). Most of these terms, except for maser and laser, never caught on and have become obsolete, apart from their use in science fiction. In the United States, the earliest public lecture on the principles underlying the maser was given by Joseph Weber at the June 1952 conference of the Institute of Radio Engineers. Around the same time, Nikolay Basov and Alexander Prokhorov of the Lebedev Institute of Physics described the theoretical basis for the maser at an All-Union Conference on Radio-Spectroscopy held by the USSR Academy of Sciences in May 1952. They subsequently published their results in October 1954. Independently, Charles H. Townes, J. P. Gordon, and H. J. Zeiger built the first maser at Columbia University in 1953. The device used stimulated emission in a stream of energized ammonia molecules to produce amplification of microwaves at a frequency of 24 gigahertz. Townes later worked with Arthur L. Schawlow to describe the principle of the optical maser, or laser, which was first developed and demonstrated by Theodore H. Maiman in 1960. For their research in this field, Townes, Basov, and Prokhorov were awarded the Nobel Prize in Physics in 1964. Since 1965, astronomers have discovered natural sources of masers in space. When atoms or molecules of an appropriate substance (called a medium) are bombarded with photons of a particular frequency, they go into an "excited" (higher) energy state and emit photons of the same frequency. In this sense, the maser involves "stimulated emission" of radiation. By putting the amplifying medium in a resonant cavity (or cavity resonator), feedback is created that can produce radiation that is "coherent." Electromagnetic waves are said to be coherent when they are propagated at the same frequency in the same phase, and they move in the same direction. By contrast, electromagnetic waves from most other sources have a range of different frequencies, they are in different phases (relative to one another), and they are propagated in practically all directions. Radio waves emitted by a maser have nearly the same frequency and their transmission over long distances is highly efficient. In the first maser to be developed, the medium in the resonant cavity was ammonia gas. In this case, the molecules of ammonia oscillated at a particular frequency between two energy states. More recently, a ruby maser has been developed, in which a ruby crystal is placed in the resonant cavity. The dual noble gas maser is an example of a nonpolar medium in a maser. Some common types of masers are noted below. The names indicate the medium present in the resonant cavity. Today, the most important type of maser is the hydrogen maser, which provides a sharp and constant oscillating signal. It is based on transitions in atomic hydrogen that occur at a frequency of 1421 megahertz. This maser is used as an atomic frequency standard. Together with other types of atomic clocks, they constitute the "Temps Atomique International" or TAI. This is the international time scale, which is coordinated by the Bureau International des Poids et Mesures, or BIPM. It was Norman Ramsey and his colleagues who first realized this device. Today's masers are identical to the original design. The maser oscillation relies on stimulated emission between two hyperfine levels of atomic hydrogen. The following is a brief description of how a hydrogen maser works. The next step is known as "state selection." To get some stimulated emission, it is necessary to create a population inversion of the atoms—that is, most of the atoms need to be in the excited energy state (rather than in a lower energy state). This is done in a manner similar to the famous Stern-Gerlach experiment. After passing through an aperture and a magnetic field, many of the atoms in the beam are left in the upper energy level of the lasing transition. From this state, the atoms can decay to the lower energy state and emit some microwave radiation. A high quality factor microwave cavity confines the microwaves and reinjects them repeatedly into the atom beam. The stimulated emission amplifies the microwaves on each pass through the beam. This combination of amplification and feedback defines all oscillators. The resonant frequency of the microwave cavity is 1420 405 751.768 Hz, which is exactly tuned to the hyperfine structure of hydrogen. 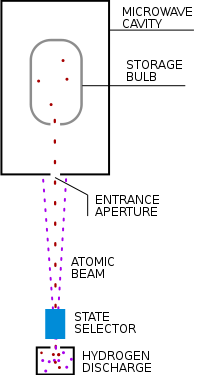 A small fraction of the signal in the microwave cavity is coupled into a coaxial cable and sent to a coherent receiver. The microwave signal coming out of the maser is very weak in power (a few picowatts (pW)). The frequency of the signal is fixed but extremely stable. The coherent receiver is used to amplify the signal and change the frequency. This is done using a series of phase-locked loops and a high-performance quartz oscillator. Stimulated microwave and radio wave emission is observed in astronomy, and this is usually called "masing," even in the absence of the resonant feedback that would be required for a true maser. Technically, this form of stimulated emission is called superradiant emission, and it is closely associated with lasing and masing. Such emission is observed from molecules such as water (H2O), hydroxyl radicals (OH), methanol (CH3OH), formaldehyde (CH2O), and silicon monoxide (SiO). Maser-like stimulated emission also occurs in nature in interstellar space. Water molecules in star-forming regions can undergo a population inversion and emit radiation at 22 GHz, creating the brightest spectral line in the radio universe. Some water masers also emit radiation from a vibrational mode at 96 GHz. ↑ 1.0 1.1 Townes, Charles H. 1964. Nobel Lecture. Nobel Prize. Retrieved June 19, 2008. ↑ Gaurang B. Yodh and Richard F. Wallis. 2001. Obituaries: Joseph Weber. Physics Today 54(7): 74. Retrieved June 19, 2008. ↑ The Dual Noble Gas Maser. The Walsworth Group. Retrieved June 19, 2008. Keating, Michael P. 2002. Geometric, Physical, and Visual Optics. Boston: Butterworth-Heinemann. ISBN 0750672625. Singer, J. R. 1959. Masers. New York: Wiley. Taylor, Nick. 2000. LASER: The inventor, the Nobel laureate, and the thirty-year patent war. New York: Simon & Schuster. ISBN 0684835150. Vanier, J., and C. Audoin. 1989. The Quantum Physics of Atomic Frequency Standards. Philadelphia: A. Hilger. ISBN 9780852744338. This page was last modified on 31 August 2018, at 14:43.